I have been asked to write about safety tips for equestrians who would want to ride the Pacific Crest Trail. I rode most of the PCT solo, virtually unsupported, from the Mexican border to that of Canada. It was a 2-spring/summer journey, in 2008 and 2009. My companion was my Arabian endurance horse, Primo. He was never injured, nor did he ever have symptoms of colic or azoturia. I would like to point out that very few equestrians have attempted to thru-ride the PCT. My research has revealed the sad and unfortunate fact that the horses, in almost every case that I am aware of, have either suffered from colic, been seriously injured, or even lost their lives during the journey. Recognize that, as a rider, your primary responsibility is to always look out for the safety and well-being of your horse – to take care as you travel that your horse will not become injured or suffer from colic. The following is a description of my approach and why it kept Primo safe. First, I will write about COLIC on the trail. Colic can be life-threatening. On the PCT it is usually caused by abrupt changes of diet. You should take care to assure, by planning ahead, that there will be as much consistency as possible in what your horse eats. To assure that consistency, I decided to carry a mixture of three kinds of processed feed. I gradually eased Primo into that diet during about three weeks prior to beginning my rides of both 2008 and 2009. The mixture was one-third each of alfalfa pellets, Equine Senior, and cob with molasses. During the two journeys I fed an average of six pounds of this feed per day. On the trail I carried all horse feed in the pommel bags – If needed, I could carry up to 27 pounds. Since I traveled unsupported, I drove my rig ahead and cached (buried) Primo’s food and mine at road crossings and trailheads. I would then park my rig at some prearranged location that I would be able to ride to and then return south to where I had last left Primo in good care. This was also prearranged. (Here’s an important tip: To keep animals out of your caches put all food in OpSaks. This product is available from REI and on-line. It is 100% odor proof and does not allow food odors to escape. It really works! I used OpSaks in caches and also in camp. I also used mothballs in cotton tobacco sacks to repel bears). By caching, I could resupply myself without having to schedule people to meet us all along the way with whatever feed they happen to bring. If they, with good intentions, bring you quality alfalfa and grain that is not included in your horse’s regular diet along the trail, there is a risk of colic. You should never feed your horse grain when he is very tired (better yet, don’t allow him to become very tired and stressed). Don’t try to cover too many miles per day. I only averaged about 17 miles per day. (The distance ranged from 6 miles to nearly 30 miles since I was always seeking camps with both graze and water). Take your time and allow your horse to graze, whenever possible, throughout the day. This is what horses do in nature. I usually tried to reach our camps by about 4:00 PM or sooner to allow plenty of time for Primo to graze. I hobbled and belled him while grazing (always keep an eye on your horse – even when he is hobbled) and put him on his highline at night. I always set up my tent as close to Primo as possible. He got his processed feed from his feed bag, usually three pounds in the evening and another three pounds in the morning before his morning graze. I sometimes took layover days if I was in a good camp with plenty of graze for Primo. Do not allow your horse to become dehydrated, offer him water whenever possible. Also, discuss this trip with your veterinarian before starting. He or she may assist you with emergency medications such as Banamine which could literally save your horse's life. Better, of course, to take care and avoid the problems. Become aware of what your horse is eating – that some plants are toxic to horses. An example of one plant to be avoided as much as possible is lupine. You will see it throughout most of the PCT. A hungry horse will want to eat it as it apparently smells OK. Primo never considered it to be a favorite. He occasionally managed a mouthful before I could stop him and suffered no ill effects. Also watch out for clover – a lot of clover at one time will be too rich in protein and can cause tying-up trouble (azoturia). Now, I realize that it is unlikely that others will try to do the PCT solo and unsupported, but I do recommend that you adapt your own feeding plan to assure that your horse’s diet will include consistency similar to what I provided for Primo. It worked. I would also like to advise those who would do the PCT regarding distance per day and how it relates to safety. I recommend that you take your time and enjoy the scenery and the entire wonderful experience. If you try to ride the entire PCT during a single season it will require that you average more miles per day than I did. Averaging too many miles per day at high elevations and on some of the more challenging trails of the PCT means greater stress, less graze time, and less rest time. This will definitely require your taking the kinds of risks that I was careful to avoid. If you feel compelled to reach a certain resupply point on a certain day and time (because someone is scheduled to meet you there with supplies), you might take risks that you should not. Suppose that you are only a few miles from a resupply location and come to an obstacle blocking the trail. Perhaps it is a fallen tree (I sawed out many trees up to about 15” diameter), or a large boulder, a scree slide on a sandy or rocky slope, a questionable snow crossing on a slope, a difficult stream or river crossing, or a washout (there will be many of all of these) - and you can see a quick way across or around that is obviously very risky. A safe way to get beyond it might take several minutes or even hours – one detour that I took ended up taking a day and a half but didn’t involve risks to Primo. If you are trying to stay on schedule, and/or to meet someone who may be worried about you if you do not show up as scheduled, you might be tempted to take the risk and hope for the best – but instead you could end your journey by injuring or killing your horse or yourself. Don’t rely on being lucky or on prayer to get you safely past a risky situation. The PCT is often very beautiful and even spectacular and its trails are usually quite safe for horses. But parts of it can also be tough and unforgiving – don’t underestimate the trail, or overestimate your ability to ride it – especially don’t be on a tight schedule. Hikers do not have to do nearly as much research of trail conditions as the equestrian should. It is much easier to hike the PCT than it is to ride it. In addition to the research done at home prior to leaving, before starting each new section, I rechecked conditions for the Section ahead when I reached my rig again. I called Rangers, Packers, the PCTA local representatives, Backcountry Horsemen and other local equestrians to get current information on trail conditions. I always tried to talk to people who had ridden on that part of the trail recently. (I have found that information coming from hikers is usually unreliable for an equestrian. They do not see trail conditions through the eyes of a horse and rider.) Through your research you can find out about scheduled work crews who have already removed or will soon remove last years’ fallen trees and have done trail damage repairs. You can also find out about areas that might be unsafe for horses due to known hazards or to deep snow not yet melted. You will lose the trail in deep snow – and you don’t know what is under it. It is always risky to try to ride through deep snow. Trail crews won’t go up to clear down trees and repair trail damage until most of the snow has melted. It might be necessary (and smart) to bypass some areas if they are still considered impassable or unsafe for horses. Keep in mind that trees can, and do, fall at any time of year - so, expect the unexpected. When you do ride around a corner on a narrow trail with steep drop-offs and come to an obstacle – just stop, pause, don’t do anything until you have carefully considered your options and the possible consequences of each. Especially important -don’t be influenced by the extra time it might require to take the safer option. Your priority must always be the safety of your horse. Bring a small saw capable of cutting through at least a 15” tree. I brought along a Silky brand folding saw with a 14.5” blade that cut on the pull and could also cut from the tip – the model is called “Big Boy”. Using wedges (I made mine out of wood) and time I would be able to cut a tree up to about 18” if necessary). Using your saw can safely open a blocked trail. I cut and removed many trees on my ride with Primo. I also brought a metal digging trowel with a 3.5”wide blade and used it to do trail work on a couple of occasions when a shovel would normally be required. A shovel would have been too large and heavy for a solo rider to bring. 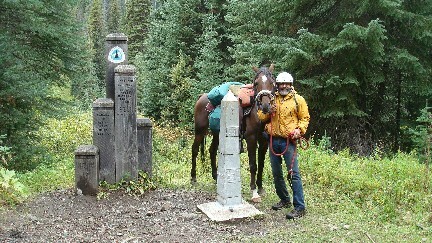 Recognize that not all horses are equally well suited to face the challenges of the Pacific Crest Trail. As for breed, an Arabian, a true Mustang, or possibly a Morgan would be favored. Individuals of other breeds might also be good choices. You want a horse that is not too large or heavy and that is strong and in good condition with as much trail experience as possible – I mean rough and challenging trails, not smooth, well-maintained trails. Do not choose a horse that has spent his life in a stall and paddock with access to only a smooth pasture. Look for a horse that has been on very rough terrain with holes, mud, steep and slippery slopes, rocks, etc. This fine-tunes his sense of balance and, from experience, teaches him how not to fall – where to place his feet. The horse that you select should have good feet and be athletic, sure-footed and agile. He should not be a horse that often stumbles. You don’t want a horse that spooks easily along roads or if confronted by other animals. What will he do if suddenly confronted by a horse-eating stump or boulder, or a dumpster or plastic blowing in the wind? How about a bear, a deer, an elk, a grouse suddenly taking flight, a goat, a rattlesnake, a llama, a bicycle, a motorcycle, an ATV, a windmill, or moving shadows of a windmill across the trail, or a truck? You will see all of these and more during a PCT ride that crosses several sections and hundreds of miles. Try to introduce your horse to as many of these as you can before taking him on the PCT. It is true that you aren’t likely to find the perfect horse for the PCT – but try. Primo’s nemesis turned out to be llamas. We came upon three of them unexpectedly in Washington and he was terrified. Fortunately, I had time for a quick dismount. He ran in circles at the end of his extended reins, snorting loudly. He knocked me down, breaking loose, and then ran off at a gallop. Fortunately, I was able to track him down within about two miles. He could have gone much farther . . .
For your own safety in the wilderness, especially if you ride alone and ever become separated from your horse (realize that this can happen, and you might also be injured and alone for some time), I feel that it is a good idea to always carry a knapsack on your own back containing what you might need to survive in an emergency. (When Primo was frightened by the llamas I had my knapsack). Among the things that I pack in my knapsack are my sleeping bag and extra clothes in a trash compactor bag (to keep them dry in case of rain), water, a few energy bars, wind-proof/waterproof matches, a small candle, a first aid kit, knife, compass, whistle, my l.e.d headlamp, two large garbage bags (to make an emergency shelter), my SPOT, etc. (A SPOT is a satellite messenger/locator. It even has a 911 button.) All of this totals about 19 pounds. It becomes part of rider weight and therefore is easier for the horse to carry than if it were “dead weight” packed in your saddle bags. I also wear a riding helmet. Primo, who stands 14.3 hands and weighs 900 pounds , never carried more than 250 pounds – usually 10 to 15 pounds less. If everything carried, including me, would exceed 250 pounds, I walked – which I often chose to do anyway. An advantage of the Arabian breed is that they have strong hindquarters and their backs are short and very strong. They have fewer ribs and one less vertebra in their backs than other breeds. They can carry more weight. My saddle bags and the large cantle bag, packed, including five days of my food, weighed 40 pounds. Primo had no problem with that much weight behind the saddle. If you decide to travel with a pack horse or mule be sure to get qualified instructions on packing from someone who is very knowledgeable. Never hard-tie your pack animal to the back of the saddle of your riding horse. You must always use a break-away. A person who didn’t use a break-away lost both of her horses in 2009 – a very sad and tragic incident. She was on a part of a detour of the PCT that was notoriously dangerous to stock. I had pre-arranged to trailer Primo around that place. I have no personal experience using a pack animal. It is my opinion, having ridden most of the PCT and having seen many challenging places along the trail and on necessary bypass detours, that in some of those situations, having a pack animal along might become a real hazard… just my opinion. Before starting my two PCT rides I took overnight and multiday check out trips to test everything – the horse, the tack fit, and all of my equipment. Before starting your PCT ride you should practice setting up camp, high lining your horse at night, getting him used to that and also hobbles. Such rides will also help you decide what you really need to bring along. Wise, generous and friendly, Ed died unexpectedly in 2014 of a heart attack while preparing to set off with Primo on the Pacific Crest Trail that he loved. To see his obituary, click here.